Wild Fashion Prints are preprinted transfer materials that you can plotter cut in the shape of lettering, numbers or your custom design. 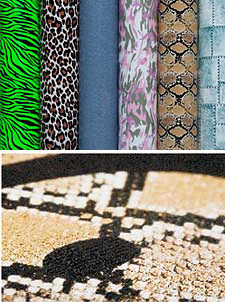 Choose from camouflage backgrounds, Cobra Skin, Leopard fur designs, Denim designs, Carbonium prints and a Techno Diamond pattern. Wild Fashion Prints are for cotton, polyester knits, and cotton-polyester blends.